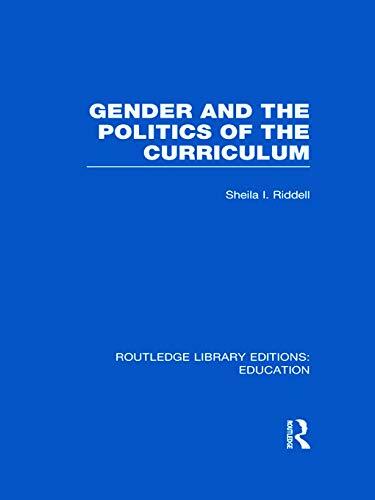 This book uses detailed case studies of two secondary schools to examine the relationship between curriculum choice and gender identity among fourteen-year-old pupils making their first choices about what subjects to pursue at exam level. It reveals a two way process. Pupils’ decisions on what subject to take are influenced by how they perceive themselves in gender terms, and the curriculum once chosen reinforces their sense of gender divisions. The author looks at the influences on pupils at this stage in their lives from peers, family and the labour market as well as from teachers. She argues that the belief in freedom of choice and school neutrality espoused by many teachers can become an important factor in the reproduction of gender divisions, and that unless the introduction of the national curriculum is accompanied by systematic efforts to eradicate sexism from the hidden curriculum it will fail in its aim of creating greater equality of educational opportunity among the sexes. Sheila Riddell is founding director of the Centre for Research in Education, Inclusion and Diversity at the University of Edinburgh and coauthor of "Patterns of Lifelong Learning".